Riverhold is one of the eight-major cities in the province of Elsweyr, found along a streaming river in the region of Anequina. Riverhold is well-known for their swarming, and overcrowded marketplaces, more though than other city-states of a similar stature. People across the northern countryside flock to the markets of Riverhold, to sell their goods and trades from their carriages. Riverhold is found in northern Elsweyr, a part of the greater region of Anequina, which is known for their harsh badlands, and its arid plains. Riverhold is found where three roads meet. The walls of Riverhold have been described in hues of saffron, irregular, and not so tall. The inner city has large domes of faded colors. The town of Sheeraln is found outside of Riverhold. :144 As mentioned before, Riverhold is filled to the brim with swarmed marketplaces. The land surrounding Riverhold contains the pride lands of Noble Senche Lions, which are commonly used by the northern pastoral tribes in transportation, and move herds of livestock. They are earned the title of Noble because of how loyal and brave they are. Every year for the Midyear celebration, the Khajiit give out moon sugar sweetcakes. Interestingly, Riverhold is the closest city-state in the entire continent, to be the closest towards City Isle, in the province of Cyrodiil. This is not counting the county cities of Cyrodiil though. Riverhold is neighbored by several settlements, including Kings Walk to the southeast, and Tardorn Wood to the west. 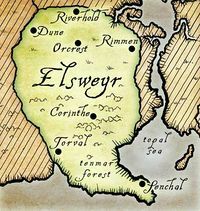 By the late First Era, the Kingdom of Riverhold was under the occupation of Second Empire, along with the rest of Elsweyr. In fact, during the Four-Score War, amidst the Battle of Bodrum, Queen Naghea of Riverhold would lead the left flank with Lord Storig of Farrun. But their forces were nigh obliterated and killed on the Pryai River, where their soldiers were killed in a wall of spears. It is unknown whether Queen Naghea perished in battle. In 2E 560, the Knahaten Flu had spread across southern Tamriel, heavily afflicting the province of Elsweyr. Riverhold was one of the cities in Elsweyr to be afflicted. It had begun in Senchal and go into the harbors of Alabaster, where it would spread into the rest of the province. Amidst the suffering of the flu, the Empire of Cyrodiil would invade the land and cities of northern Elsweyr. The cities of Riverhold and Orcrest were conquered and annexed by the Imperial Legion around 2E 562. A retaliation effort coordinated by the Khajiit would attempt to reclaim these cities but it would fail. The Khajiit warrior, Namu led a squadron in the campaign but had fallen in battle. But as conflict subsided, the Khajiit would slowly overcome the flu. Rathuni-la Dawnwhisker, a daughter of Azurah would distill sorghum-tea that severely weakened the worse side effects of the Knahaten Flu. During the Imperial Simulacrum in the late Third Era, the city-state of Riverhold was an active settlement, being ruled by King Ab'dul. It had a rivalry with Dune and Orcrest. This page was last modified on 10 April 2019, at 19:28.